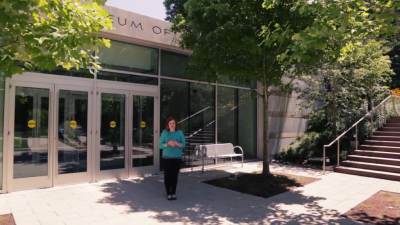 Jessica Whalen (Alumni): Hi, my name is Jessica Whalen and I am the digital media producer for Crystal Bridges. Crystal Bridges is a museum located in Bentonville, Arkansas. And it is specifically an American Art museum. Basically my responsibility is to create a creative video presence for Crystal Bridges. This is my pod. This is where the whole digital media team works with the web developer and the web designer. I double majored in Digital Media with an emphasis in cinema and I also majored in Intercultural Studies with an emphasis in missions. Every day I am so thankful that I chose to go to JBU and that God allowed me to go there. I feel like I was taught well even beyond the practicalities of my major. The farther out I am from college the more I realize just how well prepared I was for a life outside of college. And I never in a million years thought that two years after college, I'm only 24, and I'm working in a place that has national recognition. So, this is nothing like I thought I was going to do but it's a lot better than what I thought I was going to do as well.